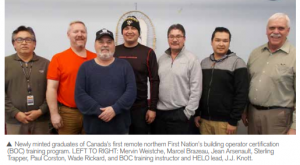 Congratulations to our maintenance staff for becoming the FIRST ever remote, northern, First Nations graduates to become Building Operator Certified (BOC) by the Canadian Coalition for Green Healthcare and Healthcare Energy Leaders Ontario. The competency-based BOC training offered improved our teams’ technical expertise and job skills to improve our facilities so that they are more comfortable, energy efficient and environmentally-friendly places of treatment and care. With new skills and training, we have begun to reduce greenhouse gas emissions, decrease operational costs and enhance the quality of care we provide to the people in the communities we serve. Read more on page 22 of the 2018 fall issue of Canadian Healthcare Facilities.